Jewellery boxes can be an incredibly important gift for somebody who holds a personal attachment with many objects. It’s hard to get a keep track of all of our favourite garments and possessions, so make it as easy as possible for somebody you care about with one of our hand-crafted jewellery boxes. Jewellery is something that you never want to lose or misplace, and our spacious boxes come with eye-catching designs and separate compartments inside, as well as varying sizes. Once known as a casket, jewellery boxes come in many styles and sizes, as well as unique textures and formats. 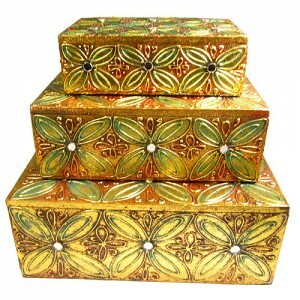 We provide a variety of different trinket boxes that let you choose how modest or elegant you wish to go. We take real care and precision with the designs that we create for jewellery boxes, and have an immense pride in the quality of the outcome. Taking inspiration from many parts of the world, our jewellery boxes will enhance any display while keeping your most valuable goods safe and secure. Whether it’s for one key piece of jewellery or the full set, we have something that will suit everybody here. If you want to pick up a classy jewellery box, then just pick from our list below with various styles and sizes available. Even if you just want to pick this box up as a decorative object for a friend – or for yourself – then our jewellery boxes work as excellent ornaments as well as widely functional cases for your prized jewellery. Find out more about jewellery boxes here.